Heavy Duty Ramps offers a number of ramp accessories that are used in conjunction with our loading ramps. These accessories make loading ramps even easier to use, while increasing your safety and efficiency. Ramp skid seats are support brackets that are welded to the truck or trailer, allowing our pin-on style ramps to be securely attached to the vehicle. They are available in steel or aluminum. These brackets can be mounted to the upper and lower decks of a drop deck trailer, flat beds, and some dry van applications. Skid Seats include the ramp connecting rod and pin clips. The aluminum seats are available in 4 widths – 24″, 36″, 48″, and 97″. Welding the seats to your trailer is the preferred method to attach them, but they can also be bolted on if the trailer structure supports them properly. The aluminum skid seats can be cut to fit around stake pockets on upper or rear deck. The steel skid seats are available in 24” or 36” wide, but please note, welding to the truck or trailer is required. 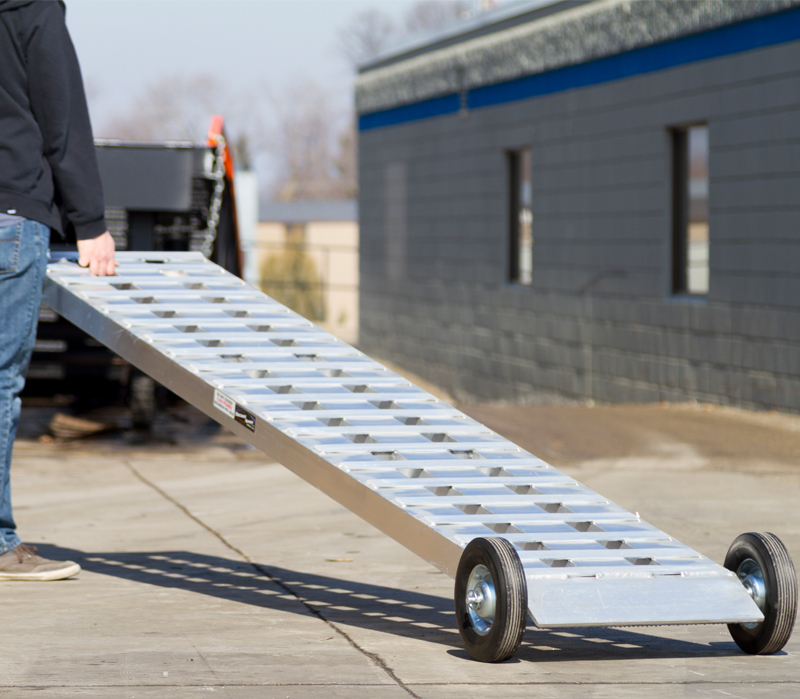 A ramp dolly allows you to easily transport, set up, and position your ramps. The ramp dolly has two 9-3/4” diameter solid rubber tires and an aluminum axle. To use the dolly, simply drop the ramp end onto the axle, and the ramp can be rolled around on virtually any terrain. The dolly is designed for any heavy-duty ramp up to 20″ wide, with hook-end, flat plate, or pin ramps. The dolly has a 220 lb weight capacity. These lightweight aluminum height blocks are designed to fit under a trailer ICC bumper when loading and unloading heavy equipment. 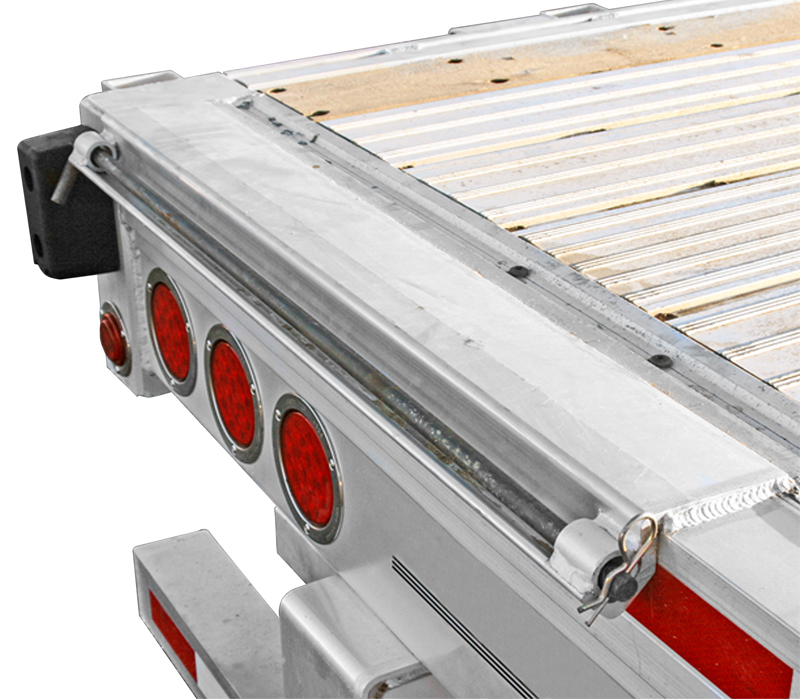 Bumper blocks prevent damage to the trailer and loading ramps by completely supporting the trailer, eliminating trailer sag caused by a heavy load, or trailers with a longer deck overhang behind the rear axle. The bumper blocks have a weight capacity of 23,500 lbs per axle per pair.